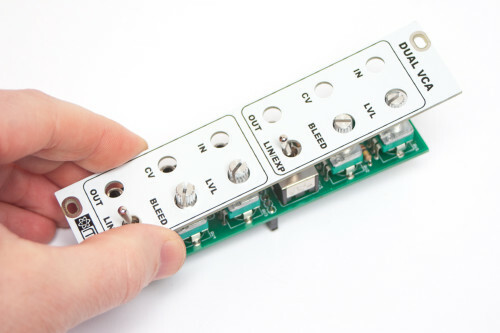 Thank you for purchasing the MST Dual 2164 AC/DC VCA Eurorack module kit! This is an intermediate to advanced build and not recommended for the beginner since it has a lot of tight fitted parts. If you feel like you can handle it please proceed! If not, get some help from a friend with experience or purchase a fully completed unit. ATTN: Please follow the BOM and these instructions and don’t populate from the PCB alone. Also sometimes we cannot get the exact pictured components, so please look over your parts and check the codes first. Lets begin with the MAIN Board. 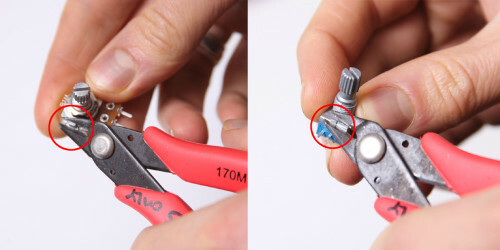 Start with the diodes as shown below, then turn over on a firm surface to solder, then clip your leads. Diodes are polarized components so you must match the black stripe on your diodes with the white stripe on the PCB silkscreen. Populate first, then turn over on a firm surface to solder and then clip leads. 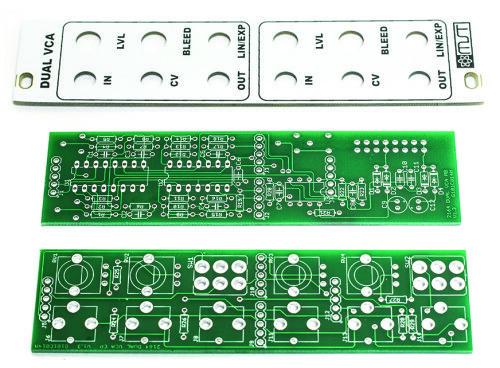 Place the IC Sockets by aligning the notch with the notch graphic on the PCB Silk Screen. Turn over on a flat surface and solder into place. Now populate the capacitors as shown below. These caps are not polarized. Turn over on a flat surface to solder and trim. Next, make sure you orient the electrolytic capacitors in correctly. The longer lead needs to be inserted into the hole that has the “+” marking near it. Solder and clip. Now populate the 5-pin headers as shown below. Carefully turn over and solder. 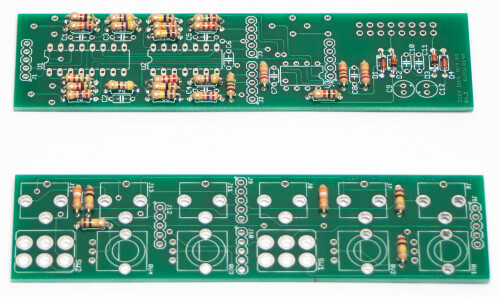 Populate the trimmer resistors on the rear of the PCB as shown below. Turn over to solder and trim. Next add the 16-Pin Eurorack Power Connector in place by matching the key notch with the key indicator on the PCB silk screen. Now add the 5-Pin female headers to the rear of the control board as shown below. Turn over to solder, then trim. 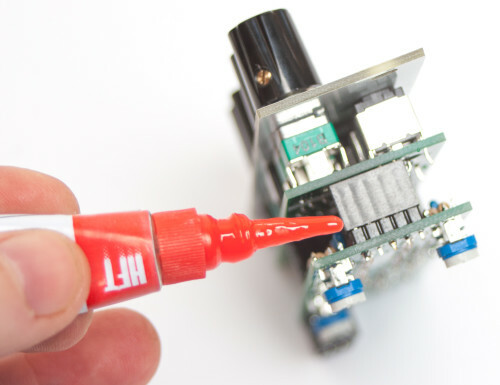 Don’t forget to cut the nubs on the potentiometers as necessary. Now PLACE (do not solder yet!) 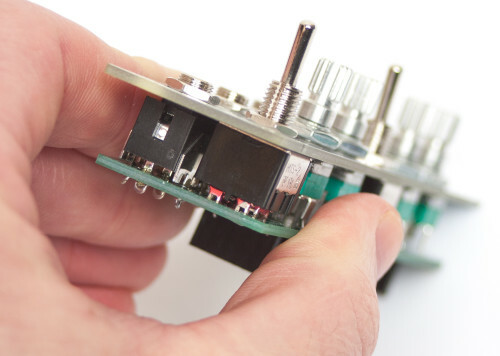 the jacks switches and potentiometers in the circuit board as shown below. Make sure to remove ALL the nuts and washers from your switches before panel placement. Now place the panel over the jacks, pots & switches. Now fully tighten (not too hard) down the nuts on the jacks, pots and switches. Now you will need to move the panel (please be careful and take it slow) in order to make sure that it is level with the control board. This will involve pulling the pot leads and clamps out of the board just a bit. Take your time and get this right! Now carefully turn the board over and solder the pots, jacks and switches in place. Now Carefully! connect the two boards together and NOW you are ready for testing! 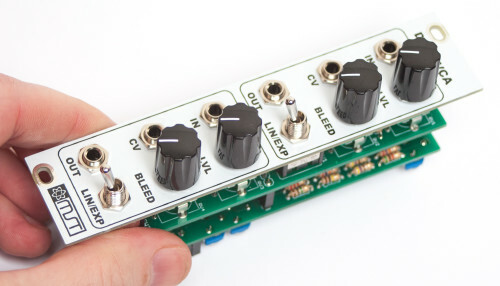 Plug your power cable into your Eurorack power supply and test away. 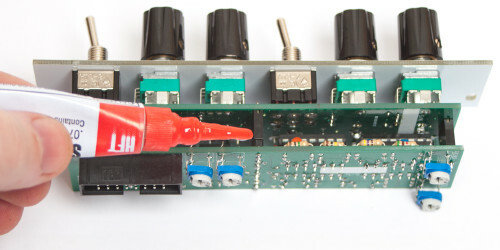 After you have fully tested your unit and have determined that it is in full working order, you can use some super-glue to bond the board to board headers together. 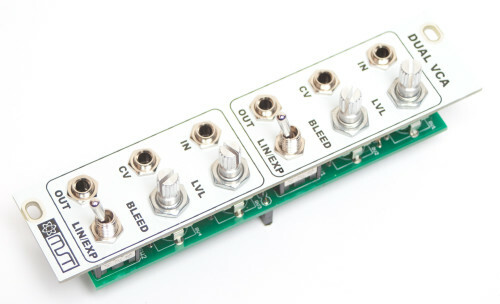 This is an optional step, but will help keep the boards together as you pull the module out of your case. Make sure to not over-glue as you may still need to pull the boards apart in the future. After that, you are ready to use your module with full confidence. Thank you for choosing Synthrotek! If you are sourcing your own parts, be aware that the Mouser ID number in the BoM for the electrolytic capacitor will give you a cap that is too big in diameter to work as shown in this build guide. Additionally I think it is too tall as well, I don’t see any way these are not going to interfere with the header clearance. I’m going to experiment with bending these parallel to the board, it looks like there is room but I also have some equivalent caps in a smaller package being shipped just in case. From what I can tell, these caps are used in most if not all of the MST line so I wanted to give a heads up to fellow builders. i just built mine and have the too-tall cap issue too. 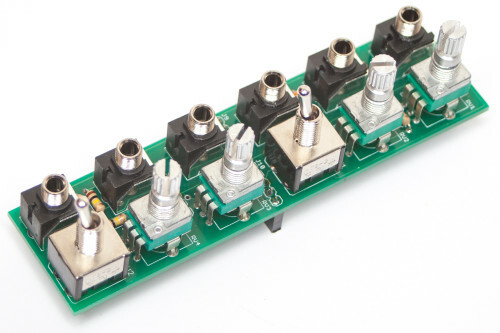 is there a danger of shorting anything if the cap touches off a solder joint on the other board or will i just need to get shorter ones or bend them a bit? You can safely bend the caps without issue, but if they touch solder joints on the top, it will short out and cause some problems. I would recommend getting shorter ones, if possible, or bending them. I built my kit using your parts, and both VCAs work fine on the Linear setting, but I am getting no output at all from the Exponential setting. I’ve looked over all the solder points, insertion of ICs, orientation of diodes, etc., and everything looks good. Do you have any suggestions for places to look for problems? Is there something I’m supposed to do with the trim pots? If you haven’t calibrated the VCA, the exponential output is going to be too low to be heard. If you head over to the Product Page, and scroll to the bottom, there are calibration instructions there. Alternatively, RT200 is the trim pot that controls the exponential function, you can just adjust that trim pot CCW until you are satisfied with the sound. Thank you, Patrick! RT200 did the trick! You’re welcome! Glad it was as simple as turning a trimmer. Just mount the electrolytics on the back of the board with the trimmers and 16 pin header. No need to reorder parts. The World's Source for DIY Audio Electronics Kits | ph:503.417.1130 | e:info@synthrotek.com | © Synthrotek. All Rights Reserved.